After two years of equipping other ships with crews, Halifax-based Horizon Maritime jumped into the deep end and bought an offshore support vessel to provide services to the oil and gas industry.Meet the Horizon Star. At 102 metres, she’s one of the biggest and most sophisticated of the roughly 30 offshore support ships sailing under the Canadian flag. This isn’t your average boat. the size of a big, square backyard pool on the ship to allow crews to safely put things in the water even when the seas are choppy. Through that moon pool, crews aboard the Horizon Start will be able to deploy remote-controlled underwater vehicles that look like small submarines to check out drilling rigs. They’ll also be able to put equipment and parts through that opening. The ship has a crane aboard with the capacity to handle massive equipment and reach down three kilometres below the surface. That’s the dark abode of the such monstrous sea creatures as the nightmarish fangtooth fish and vampire squid. It’s also nearly the average depth of the bottom of the ocean floor. Sean Leet, president of Horizon Maritime, would not divulge Tuesday how much the company paid for its first ship. But Leet did make it clear the downturn in the oil and gas industry has allowed the company to get a good deal for the Norwegian-built Horizon Star. Christened about two weeks ago near Ulsteinvik, Norway by Jodie Thornton, wife of Horizon Maritime executive vice-president Steve Widmeyer, the subsea intervention and offshore field support vessel is now docked at Bay Bulls, a small fishing community about 35 kilometres south of St. John’s, N.L. “The vessel is mobilizing for a mission,” said Leet. What that mission might be is being kept under wraps. Horizon Maritime’s top exec would not divulge any details of the vessel’s first contract, refusing to name either the client or the ship’s destination. All Leet would say is that it is a company in the oil and gas sector. Although she can accommodate up to 60 people, the Horizon Star is to have only 16 crew members on a regular basis. It also carries two high-speed rescue boats, an iceberg and emergency towing winch, and firefighting equipment aboard. The ship is also certified for oil spill recovery. 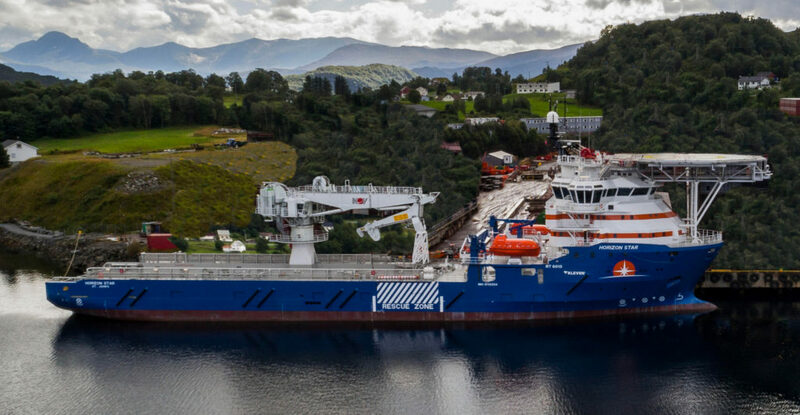 Horizon Maritime vice-president of business development Graham Curren said in a statement the company bought the vessel to provide more flexibility and capacity for offshore services. The Halifax startup, which has the backing of Clearwater Seafoods founder John Risley’s CFFI Ventures, turned to a Norwegian shipyard for the Horizon Star, which is 100 per cent owned by Atlantic Canadians, because of its reputation for quality. “The yard that built this vessel is one of the best-quality shipyards for this class of vessel,” said Leet. reduced vibration and noise levels at high speeds. The Canadian-owned and registered vessel was built and christened in Norway because maritime lore has it that it is bad luck to sail a vessel that hasn’t been christened. Apparently, Horizon Maritime didn’t want to tempt fate. The company, which currently employs about 100, has seen its workforce grow steadily over the past two years and now has people in Newfoundland and Labrador, Nova Scotia, Fort McMurray, the Northwest Territories, British Columbia, and globally in such areas as the Gulf of Mexico, the Caribbean, Europe and the Far East.